Iconic in Durham’s culinary culture since the 1950s, Bullock’s is a family-owned and -operated restaurant known for its bountiful family-style meals. It also draws in celebrities. The restaurant has fed everyone from Dolly Parton and Kenny Rogers to Robert Duvall and Faye Dunaway. Framed photographs covering the front entrance walls provide ample evidence. The famous and locals alike come in for Bullock’s legendary vinegar-based Eastern-style barbecue as well as the copious Southern-style vegetables. Whether you want butter or green beans, candied yams or creamed corn, fried okra or coleslaw, it’s all covered. If you’re looking to save some coin or don’t need as much food, consider a barbecue sandwich or a daily special with three vegetables. Boiled, grilled and fried seafood is also available on the restaurant’s extensive menu. Be advised: Leave your credit card in your wallet, as Bullock’s only accepts cash and local checks. 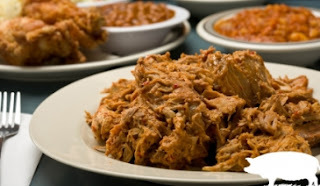 OK, this may be a controversial statement, but I personally believe Tommy Bullock makes the best "Q" in the Old North State!